Screen sharing has been requested by users for years to improve their overall meeting experience. The time has come to deliver leading edge screen share capabilities to enterprise companies, along with Dolby Voice digital audio, The Dolby Conference Phone, and superior surround sound. HD video conferencing from BlueJeans Network is leveraged by some of the world’s hottest brands; and for good reason. Video conferencing promotes face-to-face communication between in-house and remote workers in a way that audio-only or web conferencing calls never could. Of course, one of the most important features driving better collaboration and efficiency is high-definition screen sharing. Discover how screen sharing with BlueJeans drives innovation for businesses worldwide. Screen sharing is a vital presentation tool, especially if you want to showcase a presentation, spreadsheet, or video during your meeting. 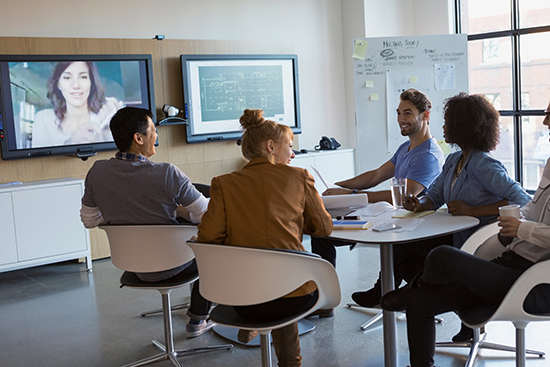 Thankfully, BlueJeans makes online screen sharing easy for both office-based employees working from a Huddle room and remote employees connecting via the cloud. Online meetings can also be recorded and saved, using screen share with audio, and played back anytime via a downloadable MP4 or custom URL. BlueJeans’ effortless screen sharing with exceptionally clear sound allows users to work in new and innovative ways. For instance, when executing a sales pitch, BlueJeans HD screen sharing capability allows anyone to quickly conduct demos without taking the extra time to make appointments or spend time traveling. Instead, you can simply present product demos online by sharing your screen and address the client’s questions promptly and without missing a beat. Get a taste for all that BlueJeans has to offer (including screen sharing with audio) by starting a free trial today.